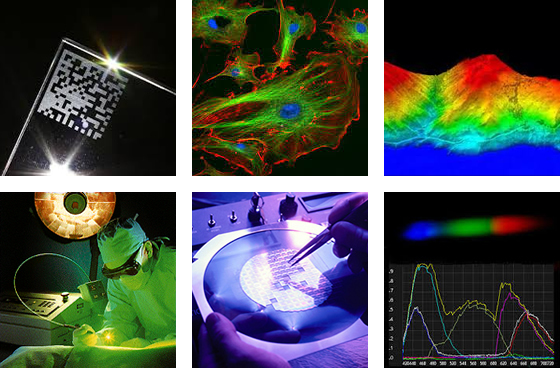 APE’s OPO & OPA laser systems, femtosecond diagnostic tools and pulse management devices are used extensively in many applications within several markets including, but not limited to, scientific research, medical/biomedical, semiconductor and industrial. Our hands free OPO & OPA systems enable simplified scientific research and industrial applications without the need of any laser knowledge. The seamless integration capabilities and high quality of APE’s diagnostic tools, such as autocorrelator, FROG and SPIDERS, make them ideal for industrial applications and integrated scientific research. The menu below is a cross-section representation of applications in today’s markets. Questions regarding products for applications not listed here should be directed to moc.a1555636011cirem1555636011a-epa1555636011@sela1555636011s1555636011. The picoEmerald and the Levante OPO systems have bee n design with the CARS and SRS application in mind. The optimized optical bandwidth for superior imaging, seamless integration with any microscope and hands-free operation make them the ideal candidate for Imaging Core centers and specialized laboratory environments. From material processing to scientific and medical based research, ultrafast laser systems are used in many areas because of their high peak intensity and extremely short pulse width. The pulse characterization is a critical factor for the adjustment of these laser systems and the characterization of experiments. APE’s autocorrelator and SPIDER series are the ultimate tools to characterize and optimize pulsed laser systems and applications. APE has developed the pulseSelect as a pulse picker, specially developed for the needs of femtosecond and picosecond laser technology, with the smallest possible dispersion and wide range of division rates [1/260’000]. The scanDelay technology offers an optical delay line able to generate a defined linear shift of an optical component with complete user control via PC software or direct control with LabView.